Hello Everyone! I made it through the weekend. LOL We had a big family reunion this weekend and it was so much fun but left no time for crafting. 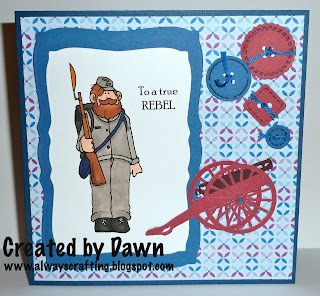 Got up early this morning to get my Rebel card done for the Hambo Hoedown Challenge. You can enter it HERE! This time we were given a Rebel soldier image to use and had to add stitching faux or real. I added faux stitching to the buttons. Hambo Hoedown - Are you a Rebel? Cool card! Love the buttons and the cannon! Thanks for playing along at the Hoedown! I love that Silhouette image! Fits perfectly with the theme of the card. Thanks for playing along at the Hambo Hoedown!